Being a Sri Lankan woman is not easy. From having to constantly battle gender stereotypes and rebel gender roles, women also have to burden the financial cost of something that is beyond them; the exorbitant costs of sanitary pads and tampons. With a population that is 52% women, you’d think that we’d know better than to tax a woman’s necessity, but we don't. 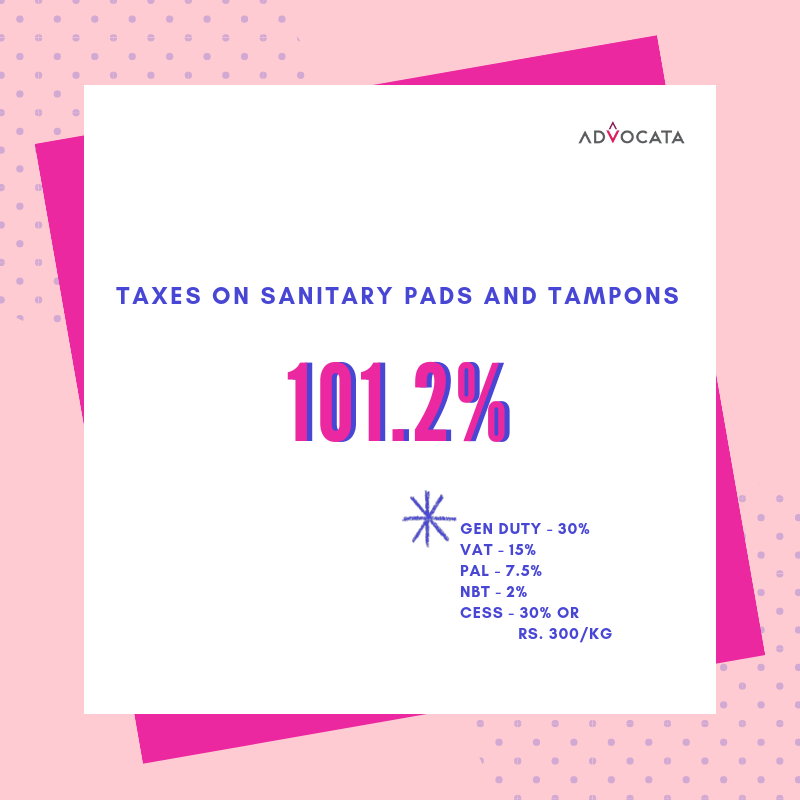 Earlier this year, the Advocata Institute revealed some data and statistics on the import taxes on sanitary napkins, which were being taxed at a total of 101.2%. It was our Fellow, Deane Jayamanne who shed light on the absurdity of taxes on diapers and sanitary napkins, both practical necessities. This tax structure is not only a reflection of poor public policy, but also a testament to how little we’ve progressed as a society. Taxing a women’s necessity so heavily (it is treated as a luxury) does not reflect well on our policy choices, especially when our progressive neighbor, India recently scrapped a 12% GST (Goods and Services Tax) on sanitary towels. At least one could say that we know better now. On that revolutionary note, in a statement last week, the Finance Minister has stated that the CESS on sanitary pads will finally be removed. However, the issue of protective taxes is much larger than just this, and needs immediate attention. In Sri Lanka, a lot of our daily necessities, from food to household products are imported. This is true in the case of sanitary napkins and tampons as well. In an ideal sense, this should allow us to take advantage of global efficiencies to source the cheapest or best products, depending on what people want. Unfortunately high taxes and poor trade policies only end in driving up the price of these products in the market. Some of the taxes generate revenue for the government but many are imposed to protect local industry. Tariff protection for local industry comes at a cost: high prices for consumers. In textbook terms, higher prices of imports means that consumers switch to locally produced products, boosting local business. However, a ripple effect of import taxes is that local producers can now sell their products at high profit margins because the selling price of the competing imported product is raised by the taxes - this is unfortunately the case of sanitary towels and many other household products in Sri Lanka. Our Resident fellow, Ravi Ratnasabapathy highlighted the absurdity of taxes on commonly used household products in his latest column on the Echelon Business Magazine. Import taxes for cereal adds up to 101%, fruit juices to 107%, noodles to 101%, aftershave to 120% , toothpaste to 107%, etc etc. The list continues. Lifting the taxes on sanitary pads is a signal that as consumers and citizens, we still have hope. Hope, that government authorities realise the absurdity of taxing daily consumption. Sri Lankan’s are literally taxed to go about their daily lives, from the toothpaste you use to brush your teeth in the morning to the ingredients that go into your daily buth packet, our taxes are absurd. Price protection for local industry is a blunt tool that hurts consumers and incubates inefficiency. Government support for industry should be directed away from tariff protection towards efficiency improvements: to upgrade technology, worker skills, improve access to capital, R&D and infrastructure. These, together with more efficient government processes, improved infrastructure, more advanced research institutions-in short a healthier business environment; can yield long term productivity gains for the economy and the firm.